China’s one belt one road (OBOR) initiative is expected to complement the Regional Comprehensive Economic Partnership (RCEP) over the long term as it would be a platform to further strengthen relationship between China and ASEAN. RCEP is anticipated to play a critical role in OBOR to promote trade and investment in ASEAN. It is another conduit for the ASEAN and RCEP countries to not only gain benefits in terms of trade and investment, but also through ongoing infrastructure projects like railways, roads and power generation assets. It will be an important catalyst to create spill over effects on ASEAN’s economic growth, remove trade barriers and create job opportunities. A principal fellow at the Graduate School of Business, Universiti Kebangsaan Malaysia Dr John Antony Xavier said the OBOR initiative will bring mutual benefit for both China and ASEAN. The initiative was aimed at improving infrastructure such as transportation routes connecting the major sea ports in the Southeast Asian region. China is leveraging on regional trade integration like RCEP to implement its OBOR initiative. “China is the leading partner in the RCEP negotiations. This augurs well for China to open up its market for economic and trading activities,” Xavier told The ASEAN Post. “The OBOR development will enable China to get connected and gain access into ASEAN markets, and vice-versa,” he said, adding that the OBOR is geographically well integrated. This initiative will also enable China to become a regional and global power. 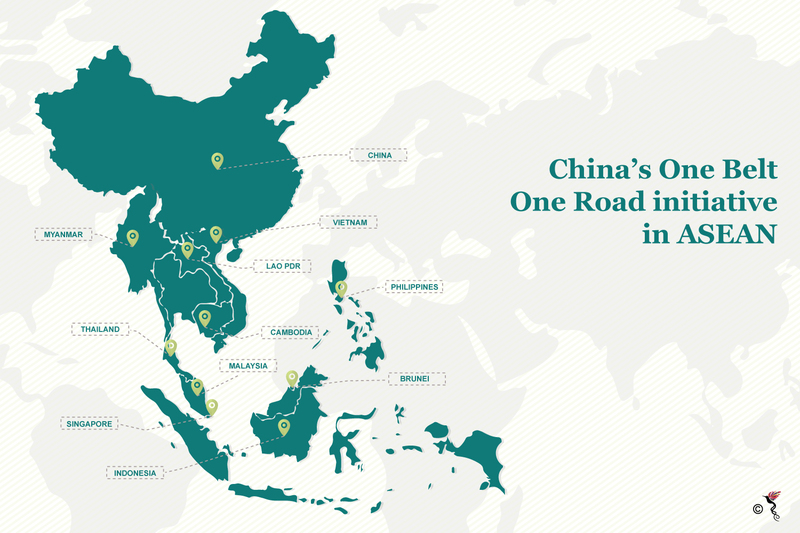 The OBOR initiative was launched in September 2013 by Chinese President Xi Jinping, which was aimed at building a trade and infrastructure network connecting Asia with Europe and Africa. It consists of two main components, namely Silk Road Economic Belt and 21st Maritime Silk Road initiatives. According to data from CIMB ASEAN Research Institute (CARI), ASEAN’s combined gross domestic product (GDP) stood at US$2.55 trillion while real GDP grew at 4.7% amidst increasingly challenging global conditions. Despite external headwinds, ASEAN economic outlook is projected to remain resilient at 4.8% in 2017, supported by solid growth of private consumption and investment as well as expansionary fiscal policy. ASEAN’s merchandise trade performance remained resilient at US$1.06 trillion in the first half of 2016 of which 24.02% was intra-ASEAN. Total foreign direct investment (FDI) inflows to the region remained robust at US$52.94 billion in the first half of 2016 of which 23.36% was intra-ASEAN. Universiti Malaysia head of department of International and Strategic Studies Dr Roy Anthony Rogers said “while both OBOR and RCEP bring in economic benefits to China and the ASEAN region, there is a need to look into aspects that will mutually benefit both nations. The aspects include technology transfer and increased job opportunities for locals in the ASEAN region.” This is how it will mutually benefit both the nations. The initiative will not only spur economic growth, but also play a role in human development. RCEP is an ASEAN driven initiative that aims to integrate economically the 16 countries in Asia and Oceania countries. The leaders of the 16 RCEP participating countries agreed that RCEP shall involve broader and deeper engagement with significant improvements over existing ASEAN free trade agreements (FTAs) and comprehensive economic partnership agreements (CEPs) with these countries. RCEP negotiation was launched during the 21st ASEAN Summit in Phnom Penh, Cambodia in November 2012. The 16 participating countries are 10 ASEAN nations, Australia, China, Japan, Korea, India and New Zealand. To date, 17 rounds of negotiations have been held. The 17th RCEP meeting was in Kobe, Japan from February 21 to March 3, 2017. The 18th RCEP round was held in Manila, the Philippines in May 2017. The ASEAN Trade Negotiation Committee was held in April 2017 in the Philippines to firm up ASEAN’s common position on key issues based on the ministerial guidance before meeting the ASEAN Free Trade Agreement (FTA) partners in May 2017. Efforts are being intensified to substantially conclude negotiations by the end of the year. Driven by the RCEP initiative, ASEAN’s GDP is expected to grow by 5.1% from 2017-2021. Following the US withdrawal from the Trans-Pacific Partnership Agreement (TPPA), an ASEAN-led initiative RCEP came on board. The RCEP is more focused on traditional matters such as lowering barriers of trade, unlike TPPA which sets regulation arounds investment, intellectual property and services.